Peace Village: We have a turnout of 10-15 people for the information meeting on the start of a Peace Village camp this summer in Forest Grove. This project, which will target middle school students in teaching skills in conflict resolution, media literacy, connections with nature and mindfulness, will take place in August. The project is a joint between our Rotary Club and the Forest Grove Daybreak Rotary Club. If you are interested in learning more or getting involved in the planning process, see Loren Waltz, Blake Timm or Julia Kollar. To learn more about Peace Village, Visit Their Website. Your Dues Are Due: Quarterly dues for the club are now due. If you have not received an invoice in your mailbox or your email inbox, you will very soon. We must pay Rotary and District 5100 dues this month, so please be prompt in remitting your payment. Rotary Foundation Update: To date, club members have contributed a total of $3,705 towards The Rotary Foundation and $1,285 towards PolioPlus. We are a third of the way towards reaching our club goals of $9,000 for TRF giving and $1,500 towards PolioPlus giving. Thank you! Be The Inspiration Award: This week’s Be The Inspiration Award winner is Loren Waltz, as chosen and presented by Jerry Frye. Congratulations Loren! Farmer’s Day: Our annual Farmer’s Day program will take place next Wed., Jan. 23. We will have a speaker from the Oregon State University Extension Service. This is our way to say thank you to all of those in the agricultural industry for all they do for our community. If you did not sign up to invite a farmer, invite one on your own! Sports Action: The results for the fall Sports Action game is in the books. Thank you to all who participated and who raised a collective $400 for The Rotary Foundation. See last week’s Rototeller for complete results. Thank you as well to Lucas Welliver for coordinating the competition. Road Cleanup Scheduled: Our next semi-annual road cleanup (along Gales Creed Road and Thatcher Road) is scheduled for Sat., Feb. 2. Meet at 8:30 a.m., at the Oregon Department of Forestry Office, 801 Gales Creek Road. For more information, please contact Jerry Hoerber. Troop 213 Court of Honor: Scouts BSA Troop 213, our chartered Scouting troop, will hold a Court of Honor awards potluck on Tues., Jan. 29, 7 p.m., at Swallowtail School, 460 Heather St., Cornelius. Rotarians are welcomed and encouraged to attend. If you do attend, please bring a potluck item to share. Thirsty Thursday/Satellite Club Meeting: The next meeting of our Satellite Club will be on Thurs., Jan. 24, at 6:30 p.m. at Prime Time. All Rotarians are welcome to attend! 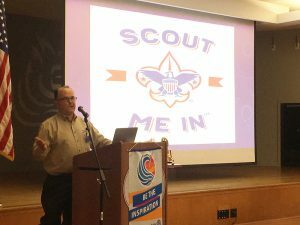 David Noyes, District Director for Boy Scouts of America as well as Rotary Assistant Governor for the Western Region (which includes Forest Grove), spoke with us today about his role both with Boy Scouts and Rotary. The underpinnings of outdoor skills are still the same as they were 119 years ago when Boy Scouts started. Some recent changes include allowing girls to join as of last year. Noyes has a leadership role into three Tuality District Cascade Pacific Council which represents western Washington County. They are currently in a growth mode and earned an award for their program delivery. 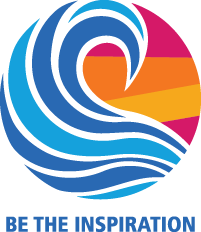 David shared about the Cascade Pacific Council’s camps, which include a number of different camp opportunities from Camp Meriwether, the council’s flagship camp, on the coast to Camp Baldwin in north-central Oregon. David also spoke to the changes that are coming for the Scouting movement, which is now known as Scouts BSA. Young girls will now be allowed to join Scouts effective on Feb. 1. While girls will participate in gender-specific troops, they will learn skills under the same program that boys do today. Troops have been given the choice to remain a boys-only troop, to have a separate girls’ troop or to have a linked girls’ troop that operates with the same leadership as the boys’ troop. Troop 213, our charterted Scout troop, has chosen to take part in the linked model. Rocky Brown, the scoutmaster of Troop 213, ended the presentation with a short update on what the troop is doing and the activities that are scheduled. Sat., Feb. 2: Road Cleanup, 8:30 a.m., ODF Office, 801 Gales Creek Rd.